Four tenants, who allegedly exhumed the corpse of their landlord before selling his property were on Monday brought before a Yaba Chief Magistrates’ Court in Lagos for their crime. – Silifatu Abisile, 60; Jimoh Abisile, 52; Gbade Bakare, 56; and Isaiah Bakare, 45. The accused are facing a five-count charge of conspiracy, kidnapping, breach of peace, forgery and false assumption of authority. Police Prosecutor Williams Ologun told the court that the accused committed the offences on Nov. 1, at Ishola Daniel str., in Oshodi area of Lagos. Ologun alleged that the accused had conspired to illegally sell the house they were living in which did not belong to them. He said that a prospective buyer had insisted they relocated the grave that was in front of the house before he would make payments. “My Lord, they forged an exhumation of corpse permit from Oshodi -Isolo Local Government and dug the corpse of the house owner, Sumonu Bakare, who was buried in the compound. “They also kidnapped the only son of the deceased; Gbenro Bakare, who is crippled, thinking he was the only surviving child of the deceased,” he said. Ologun said that the first and second accused were relations of the deceased, while the third and fourth accused were long time tenants on the property. 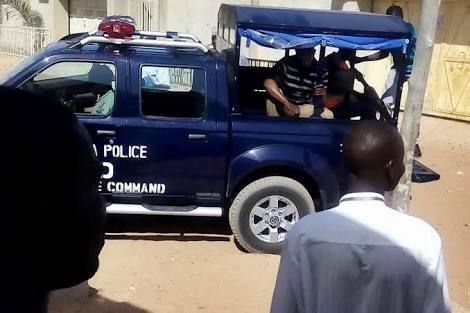 He said that the third and fourth accused had registered for change of name to ‘Bakare’, which was not their real names, claiming to be the children of the deceased. The Chief Magistrate, Mr Peter Ojo, granted the accused bail in the sum of N500,000 each with two sureties each in like sum. In his ruling, Ojo insisted that one of each accused sureties must be a blood relation and must be resident within the court’s jurisdiction, Vanguard reports.